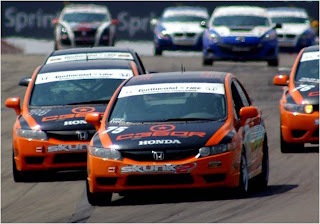 WATKINS GLEN, N.Y. (June 6, 2010) – Honda drivers and te ams continue to star in the Grand-Am Continental Tire Sports Car Challenge, taking four of the top five Sport Tuner (ST) finishing positions on June 5 at Watkins Glen International Raceway. 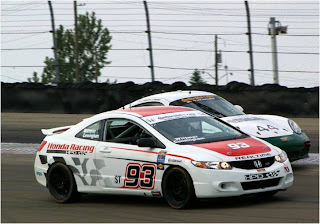 The championship-leading Compass360 duo of Lawson Aschenbach and David Thilenius piloted their Honda Civic Si to the class victory, their second class victory in 2010 and the third for the Compass360 team. The win also extended the team’s record of consecutive Continental Tire Challenge podium finishes to six. Following Aschenbach and Thilenius across the finish line in second at Watkins Glen was the Compass360 Civic Si of teammates Ryan Eversley and Zach Lutz; who were class winners earlier this season at Virginia International Raceway. Eversley and Lutz benefited from a late-race contact between the second- and third-place cars of Josh Hurley and Jamie Holtom, respectively, and moved from fourth to second in the final 10 minutes of the event. 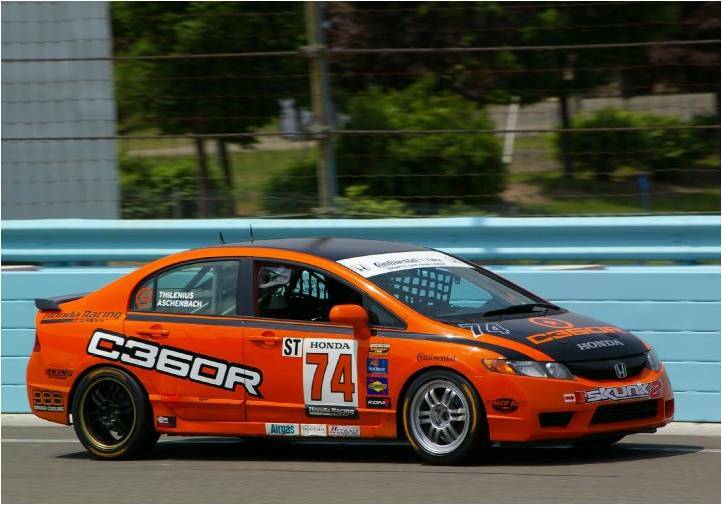 Fourth in the ST results at Watkins Glen was the Honda of America Racing Team (HART) Honda Civic Si of Mike Galati and Bryan Johnson. Comprised of associates from Honda of America Manufacturing in Marysville, Ohio, HART team members build, prepare and race their own cars, competing in variety of series ranging from SCCA solo competition to the Grand-Am Continental Tire Challenge. Just behind the HART Civic at the finish of 150 racing miles was the fifth-place HPD Civic Si entered by RealTime Racing for drivers Nick Wittmer and Peter Cunningham. This was just the second race – and inaugural Grand-Am event – for the HPD Civic. The car made its competition debut in April at the Grand Prix of Long Beach SCCA World Challenge event. 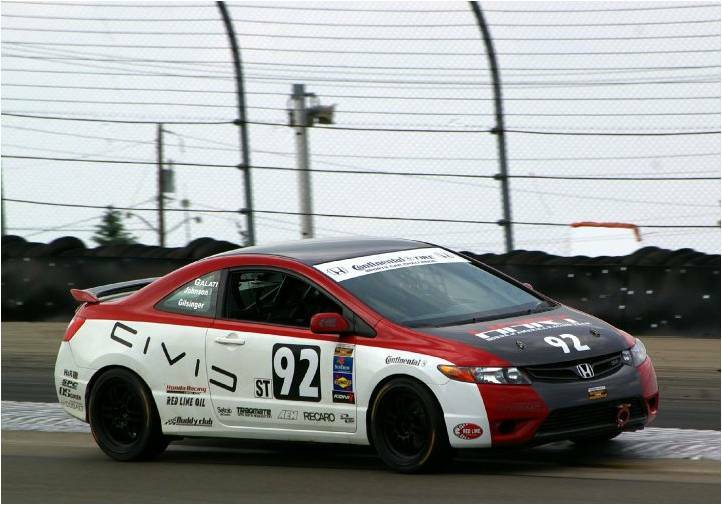 A joint effort by Honda Performance Development and Honda R&D Americas, the HPD Civic Si utilizes a variety of components from HPD’s racing parts line, approved for competition by both the SCCA and Grand-Am’s Continental Tire Sports Car Challenge. They include HPD-designed brake ducts and camber/caster plates; a lightweight competition wiring harness developed by Honda R&D; a racing fuel cell produced to HPD specifications; and the Honda 2.0-liter K20 Type R race engine. The one-two finish for Compass360 gives Thilenius and Aschenbach a 13-point lead in the ST Drivers’ Championship over the Bimmerworld BMW entry of Bill Heumann and Seth Thomas. Compass360 holds a similar lead over Bimmerworld in the Team Championship. The 1-2-4-5 finish for Honda at The Glen gives the company a 21-point lead over BMW in the Manufacturers’ Championship. Next up for Continental Tire Challenge competitors will be Round 7 in the 10-race championship, the June 19 Emco Gears Classic at the Mid-Ohio Sports Car Course in Lexington, Ohio.